In these lessons, we will learn about the properties of inscribed polygons and circumscribed polygons. We will also learn how to solve problems involving inscribed quadrilaterals and inscribed triangles. An inscribed polygon is a polygon in which all vertices lie on a circle. The polygon is inscribed in the circle and the circle is circumscribed about the polygon. A circumscribed polygon is a polygon in which each side is a tangent to a circle. A lesson on polygons inscribed in and circumscribed about a circle. The circumcenter of a polygon is the center of a circle circumscribed about a polygon. The incenter of a polygon is the center of a circle inscribed in the polygon. 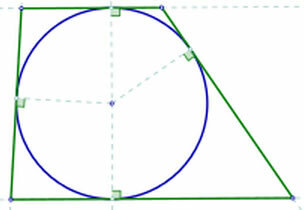 If a quadrilateral is inscribed in a circle, its opposite angles are supplementary. If a parallelogram is inscribed in a circle, it must be a rectangle. Concyclic is a set of points that must all lie on a circle. The relationship between a circle and an inscribed square. For an inscribed square, the diameter of the circle = side of square × square root of 2. How to find missing angles inside inscribed quadrilaterals? • Both pairs of opposite angles are supplementary. How to solve problems involving quadrilaterals inscribed in circles? 1. Find the measure of each unknown angle. 2. Given m∠X = 110, WZ ≅ YZ, and m∠Y = 100. Find m∠Z. A quadrilateral can be inscribed in a circle if and only if its opposite angles are supplementary. For each inscribed quadrilaterals find the value of each variable. In this lesson we looked at properties of cyclic quadrilaterals. A cyclic quadrilateral is a four sided figure whose corners are on the edge of a circle. • Opposite angles in a cyclic quadrilateral add to 180° • Interior opposite angles are equal to their corresponding exterior angle. If an inscribed triangle is a right triangle, then the hypotenuse is the diameter. If an inscribed angle has a diameter as one of its sides, then its a right triangle. This problem involves two circles that are inscribed in a right triangle. The circle with center A has radius 3 and its tangent to both the positive x-axis and the positive y-axis. The circle with center B has radius 1 and is tangent to both the x-axis and the circle with center A. The line L is tangent to both circles. Find the y-intercept of line L.